I remember sitting by a pool on holiday preparing for my interview. If I was successful I would be working in community football for the next few years. I had printed off every page of the Everton in the Community section of the club website. I studied the projects and numbers they reported reaching (5000 per year at the time). It was then I first began coming across the quote “we are not just a coach with a bag of balls”. What did this actually mean? In the past, the bread and butter of football in the community programmes had been school based development work with a spot of talent identification and loose connections to the PE curriculum. Over the years, top flight community football programmes had distanced themselves from this school based work, as they grew bigger and began to work beyond this remit tackling social issues. However, as the money years of the labour government now feels like a life time ago, community football programmes are beginning to turn their head back towards the relative stability and quite worthwhile funding available within school sport. Whether PPA, breakfast, lunch or after school clubs. This area of work has seen many coaches establish personal brands and developed reputable companies delivering solely in this area of sport provision. At this point its worth me highlighting that have seen a good range of school based development programmes from most levels of football from Chester FC to Liverpool FC. With clubs simply providing participation to other providing programmes that claim to improve fundamental movement skills. I write this post, as my daughter (the serious one to the right!) asked me if she could start after school football sessions. 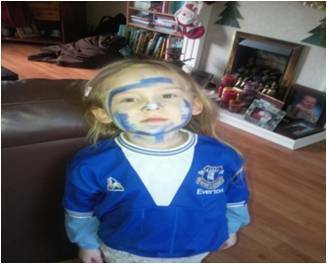 Shes an Everton fan, having been a few games, played on pitch and even gone all out with face paints, she is now one of us! I haven’t pushed her into football although I highlight girls role in football through Englands Fara Williams and Rachel Brown, pleading with her that “girls can play too!” So she enrolled, paid her money and started on Everton in the Community’s school based coaching programme. I was fortunate enough to watch some of the sessions she was involved in. Both sessions included impeccably dressed coaches, rigged out in finest football clobber…to make the heads turn in the high street and the mums whisper in the playground. Those in ‘football’ know what I mean. They also had all the cones and balls any coach would need. However, that’s where it stopped! …18-20 children have had 3 different coaches. Only 4 activity sessions have been delivered so far (due to coach sickeness). The coach spent the majority of time switching picking up and putting down cones. Organising and talking through large games within too few opportunities to touch the ball. On occasion the coach would stop to check glance at his notes (on the sheet he was carrying round). With a little bit of sadness (most Dads would share), the closest Niamh came to touching the ball in 25 minutes was in her face – what a nightmare! Moreover, we were paying for this privilege! This was, well and truly just a coach turning up with a bag of balls. Has community football developed? We know the role of the coach is huge! What’s going on? The inexperienced coaches are obviously not getting relevant support. But we can (of course) forgive the coach, but not the club. Who appear to show disregard for their values and commitment to looking after their staff and to do their job properly – which in this case – the claim was to improve fundamental movement skills. The session tonight was ran by a female coach. She was amazing with the kids and played a range of fun games. Its quite evident this was more due to her skill base rather than strategic support from the club. Maybe these ‘big’ community football programmes get so big, so strategic, that they forgetting the basics in pursuit for growth. We know they can make a big difference, but we expect more than just a coach and a bag of balls – we need quality – so please sort this out. My question to all, is are the key ‘things’ that football clubs need to consider to help create a quality community coach? Previous We all provide a quality service, don’t we?